Can Factory launched condense.it in 2006 as an application to allow us to send out short URL’s directly from internal applications without the need for an external URL shortening services such as tinyurl or bitly. So many services on the Internet create such long URL’s that using them outside of a Web browser or even just trying to remember them usually results in you seeing an error page. However, condense.it allows the creation of easy to remember short links that do not break up when you include them in emails or other applications. In the spirit of giving something back to the Internet community a front-end was put on the application to allow the public to use it freely for their own URL’s. While you can condense a URL just as it is and accept the shorter link provided by condense.it, you can also personalise your result. When condensing a URL you are given the opportunity to choose your own alias, instead of one generated by the system. In doing this you not only have a shorter URL, but one that is much easier to remember as it is individual. If you want to restrict access to the final destination of your URL you can add an access password during creation. When using your condensed URL you are then prompted for this password everytime before being redirected to the original. Emails can be sent directly from condense.it after you have created your URL. You can then share your URL quickly and easily, with no need to use your existing email service. Similar to accessing a condensed URL a password can also be added at creation to be able to go back and edit what you have made. You could then keep the same alias and constantly update the destination to point to new content. If you’ve been sent a condensed URL and want to check the destination before going to it, or you just want to check that your link points to the right place, you can use the check URL functionality to reveal the destination URL. However, if an access password has been attached to that condensed URL you would need to enter this as well. Every time someone uses your link we record a hit against it. You can see how many hits your link has had by entering your entering your alias on the URL statistics page. One of the most powerful features is being able to use your link as a transparent URL. In this way you can access all of the original URL’s files and resources from the new condensed one. A Web panel is also available for inclusion in your own Web pages, allowing users of your site to take advantage of condense.it, submitting URL’s straight to us. 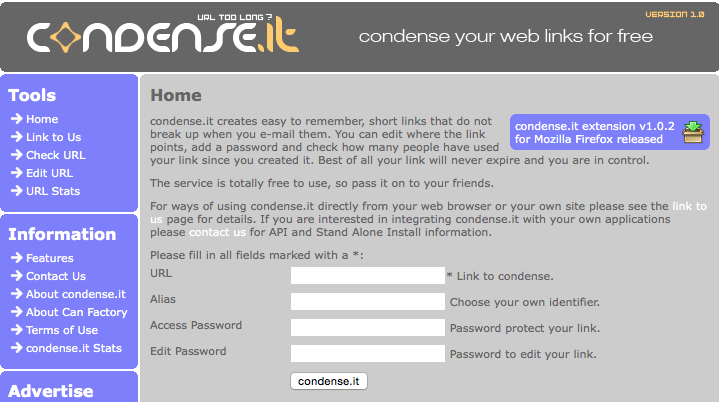 You can also take advantage of condense.it through our online API. This is a premium service and must be accessed via a secure link. Your application can then make calls directly to the API and have the results returned for inclusion in the communications sent from your existing systems. A stand alone version is available to be licensed. This stand alone version can be downloaded and installed locally on your own internet or intranet servers. The application will run stand alone or in conjunction with any relational database. The stand alone application also comes with a number of API’s to allow you to integrate it with existing e-commerce or content managment applications. If you are interested in either of the above options, please contact us.